Car brokers Kitty and Premkumar come across a vehicle, which contains a corpse. Soon, they learn that the corpse has a pen drive that holds information about a terrorist plot. 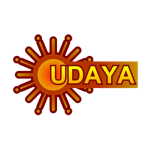 Udaya TV Kannada is a regional Kannada language Indian cable television station. It is also the very first Kannada satellite channel in India. The channel is part of the Chennai based Sun Network of Tamil Nadu. Udaya TV is available in United States, Canada, Australia, United Kingdom, Europe, New Zealand, Saudi Arabia, Qatar, Middle East and UAE.